You’ve heard me preach it before: fix those margins, align, and try and make your apps as beautiful and inspiring as you can (see also: my designer tips for developers). On Thursday, I stopped by the Windows Phone Design Team’s beautiful studio space here on campus. It’s a really creative space, packed with fun people, chill music, and a genuine desire to see even better, more beautiful apps in the marketplace. The design typically will use a Photoshop layer containing these squares, or maybe some XAML inserted on top of a page in an app, to work on alignment, visualizing the grid, etc., and making tweaks. I got to thinking: it would be nice if this could be just like the performance counters that we have for the Windows Phone: at debug time, you could opt into overlaying this grid on top of the frame of the entire app, being omnipresent. I coded up a quick implementation during that meeting and here it is! To use the counter, simply open up the App.xaml.cs file (where the other performance counters are) and add this in. I’d recommend just enabling it when you want to do a quick design pass. You can use this then both with apps on your phone as well as the emulator; it’s helpful in the emulator since you can then screenshot the UI and share that with your friends and family who can critique you on your pixel placement. // Display the metro grid helper. 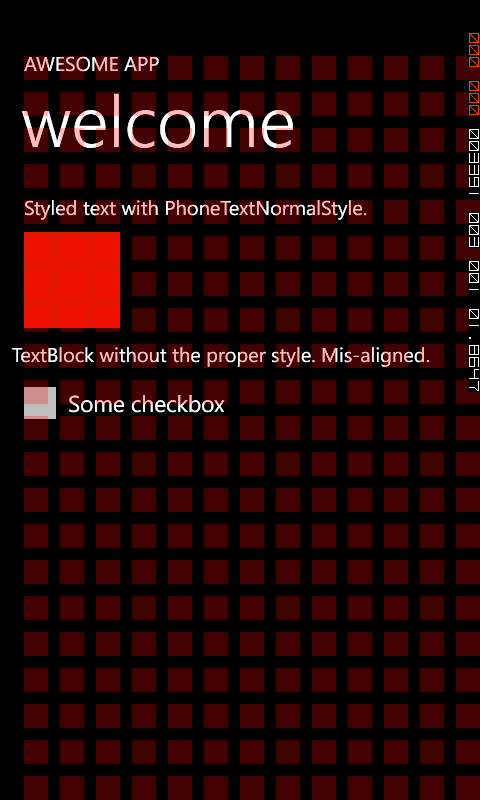 In this example, I have one of the classic Windows Phone design “bugs”: one of the TextBlocks has just been inserted, without using the appropriate standard phone style. As a result, it has a Margin value of “0” instead of being 12 pixels offset from the left. It’s more clear now with the squares, since you can see the misalignment easily. I’ve also added simple static properties for Opacity and Color if you’d rather not use the Red default color and ~0.15 opacity on the squares. The IsVisible property can be flipped off at runtime, but beware that the grid is still present in the visual tree once you add it – so there will be a performance hit (don’t ship an app that uses the grid in release builds).